The SS made scientists create a race of superhuman soldiers near Koblenz* (! ), with the mysterious involvement of the dead bodies of slain soldiers, used for medical experiments**. This happened at the end of WWII, and indeed, there was a group of soldiers who fought without weapons, killing with their bare hands. They never have been found... not a single one of them. Cut to a mysterious boat rifting afloat the sea. A female figure is lying in it, and a female narrator voice tells us that she remembered hardly anything. She is in bad shape, and the seamen who rescued her want to know what happened to her... but she cannot tell them. Flashback... to what happened. And our story begins. Sun changes colour to yellow, dark, as something is making its way underwater. 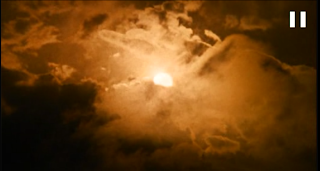 In those areas, solar phenomena always accompany occult/supernatural phenomena, wherever "those areas" are (B-Movie-Country?). 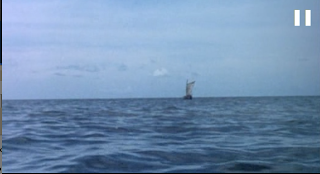 The boat attempts to get out of there (in case someone hasn't noticed yet: This place of the movie takes place on a boat. On a BOAT. Now, that we've cleared that up, let's continue). The people on the boat don't know what is happening, and they're getting uncomfortable. Their water-bound vehicle is going somewhere... and they don't know where. Especially the appearance of the sun bothers them. The captain tries to disperse the tension, but it doesn't really work. The passengers are torn amongst themselves and there are tensions flaring up with the Captain, mostly due to the blunt way of a certain guy speaking his mind. Night alls, and sleep comes.... or not? ... a Ghost Ship! Or did they?! ...and I'm not even at the 20 minute-mark! Take that, boring modern films of lower standards than Shock Waves! 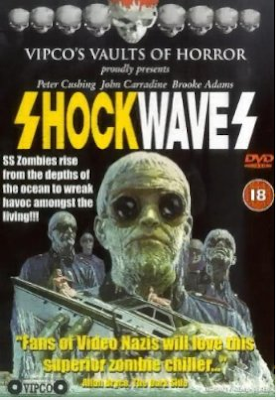 And I want to add here that Shock Waves is not exactly what I'd call a "masterpiece". Or a "good movie". Or a "solid movie". But - things are happening... which is always good in a movie. Let me begin with a short parenthesis about why I like this movie; I've first watched it about 4 (four) years ago, around 2005... could also have been 2004, I am not too sure on that one... and was half asleep and under the influence of beneficial herbal blends whose use I would never condone under any circumstances at the time of seeing it - naturally, my brain added "Zombies" + "Nazis" + "Underwater" + "Peter Cushing" to = "Awesome". And to some degree, this is true. I mean, come on: Underwater Nazi Zombies. It could only be better if it was "A Virgin Amongst Underwater Nazi Zombies"... or something like that. It has zombies, to which my generation has a very close relationship. It has Nazis, to which especially my generation in especially my country and Germany have a very special relationship with***, and... well, it has boats. 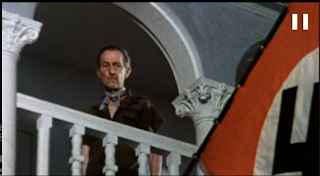 ...Did I mention it has John Carradine? Next morning, the Captain is missing. There's an islang close by, and the survivors of the crash and the succeeding night travel towards it in the small rescue boats of the Bonaventura (the name of the crap of a boat they are/were on). Whilst doing this, they find the Captain (John Carradine!) ...floating dead in the water. 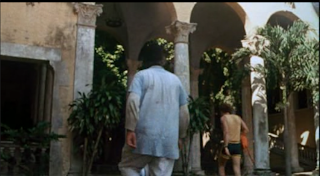 Whilst exploring the island, which has a jungle-like atmosphere, they stumble across an apparently deserted old villa. Of course, they break in to have a better look at it (have these people never seen a horror movie?). They meet its only inhabitant - Peter Cushing. Later, we find out that he knows what is going on... and that there's "danger in the water". They first really show up at around the 35 minute mark, but then we get continuously more of them rising slowly out of the sea. Within that whole SS-undead-supersoldier-background story, I actually found their slow movements to add to the atmosphere. They walk in broad daylight, and yet you feel threatened by their mindless single...minded...ness... uhm. Yeah. The people try to escape the island, and what happens is predictable - they are followed by the zombies. Underwater. Of course. I mean, they had time enough since WWII to get used to it, it's convenient, camouflage enough... plus, if this was a normal zombie movie, it would be boring. 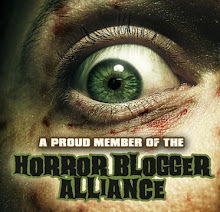 I have to admit that it borders on boringness with its spare use of zombie action until the hour mark. Sometimes, a slow buildup is good, but at times, Shock Waves is overdoing it a bit. 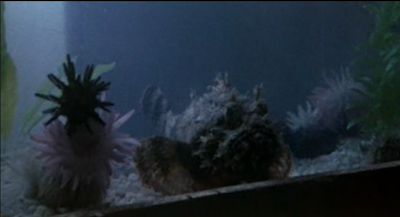 The camera shots are at time really good, and although with little effects, they managed to get the Underwater Nazi Zombies across as weird and alien. 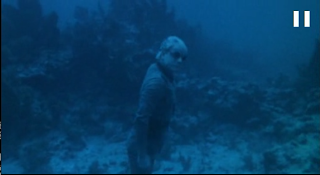 They're just not what you expect from an underwater zombie - I mean, look at the zombie at the begin of Zombie Honeymoon, that's how you normally picture an underwater zombie. But these...? These are creepy. Well, not really, but in a zombie-way for someone who has already seen a lot o movies with zombies in them. 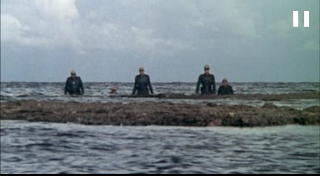 You'll like the scenes of the Underwater Nazi Zombies rising out of the water. All in all, the movie isn't bad, if at times unnecessarily drawn out. If you want to see Underwater Nazi Zombies for the first time in your life, watch this flick. If you know of any other Underwater Nazi Zombie films, please let me know. It's an endearing subgenre. ***Depending on your political views and what you went through in school. I'm naturally left-wing oriented, with anarchistic leanings, so that does not bode well for me being of the enthusiastic relationship with Nazism-sort, but 5 (five) (!!!) years in school with NOTHING BUT LEARNING ABOUT WWII IN HISTORY CLASS DOWN TO EVERY LITTLE DETAIL AND HAVING THE GUILT PUSHED INTO YOU will make you, or at least me, a Nazi-hating leftie. Who thinks Nazi Zombies are awesome. Just as Jesus Zombie****. Or vampire zombies*****. *****www.lastblood.net, thanks to Amalgam for that link originally. Zombies and vampires. Check it out. ******Which already appears on Samarra-ware type pottery in Mesopotamia around 5000 BCE, so sue me, it's an ancient symbol. *******I apologise for the lack of detailed actor names, but I can't for the life of me figure out who is who at the moment, so please forgive me. I saw this at the drive in when it came out and had no idea what it was called. 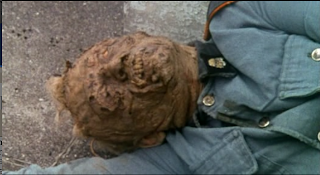 I googled underwater nazi zombies, because thats all I remembered of the movie, and here you are!